Poecilia reticulata -Native to northern South America in Venezuela, Guyana and Brazil as well as several Caribbean islands, including Trinidad and Tobago, Barbados, Antigua and Barbuda and the Netherlands Antilles. 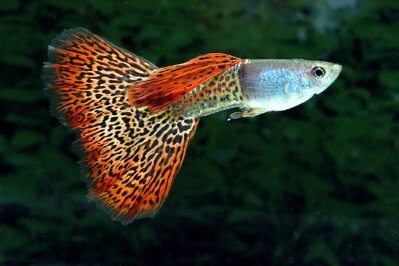 With the vast majority of the guppies on sale being mass-produced in the Far East and Eastern Europe. Introduced or feral populations also exist in around fifty other countries across the globe, including the UK. This is the most common guppy that we see commonly in fish tanks, and this name is widly agreed upon as the correct name for the breed, although it is sometimes referred to as Poecilia (Lebistes) reticulatus by some taxonimists. Males mature at 2 months and females at 3 months of age. Aquarium keeping: in groups of 5 or more individuals; minimum aquarium size (60 cm) or (24 inches). The Guppy originates from fresh and slightly salty waters in South and Central America. In Florida in the U.S. you can find guppies in the water. The Guppy has been deliberately set free in several Asian waters in an attempt to combat malaria by decreasing the number of mosquitoes. A very popular and widely available group in the guppy world. In Australia, wild populations were established prior to the 1970. You should have more than one guppy in a fish tank, larger aquarium that can house several Guppies is recommended. You will also need basic equipment: a heater, thermometer to keep the water temperature suitable, a filter to handle the proper gallons of tank water, fish net, an algae scrubber to keep the aquarium clean, and an air stone or similar to keep the water high in oxygen. You can also use rocks, fake branches and fake weeds to decorate the aquarium. The bottom of the aquarium should be covered with gravel. You need to buy a dechlorinating chemical from your fish store to remove harmful chlorine from the tap water. Your Guppies will do best if you keep the water temperature between 75 and 85 degrees Fahrenheit in the aquarium, and the pH between 6.8 and 7.6. Your Guppies should be fed once or twice a day. It is very important not to over-feed your Your Guppies should be fed once or twice a day. It is very important not to over-feed your Guppy. Put a little food in your tank and see if it is consumed in a few minutes. If not, you are feeding your Guppy to much food in one serving. Ask your pet store for the right fish food. A flake food diet is good for the Guppies, but should ideally be supplemented with live food. Your Guppy can survive on flake food for life, but the live food makes the Guppy more well-nourished. Live or frozen Brine Shrimp is a popular Guppy fish food. Micro Worms, Blood worms, Fruit Flies, Mosquito larvae, chopped up Earthworms are other suitable food for your Guppy.